An opportunity has arisen to take the first step towards a career in finance​ with an apprenticeship at the Combined Cadet Force and Army Cadet Force Associations (CCFA/ACFA). The position is available from September 2018 and will see the post-holder work towards an AAT Level 3 Advanced Accounting qualification. 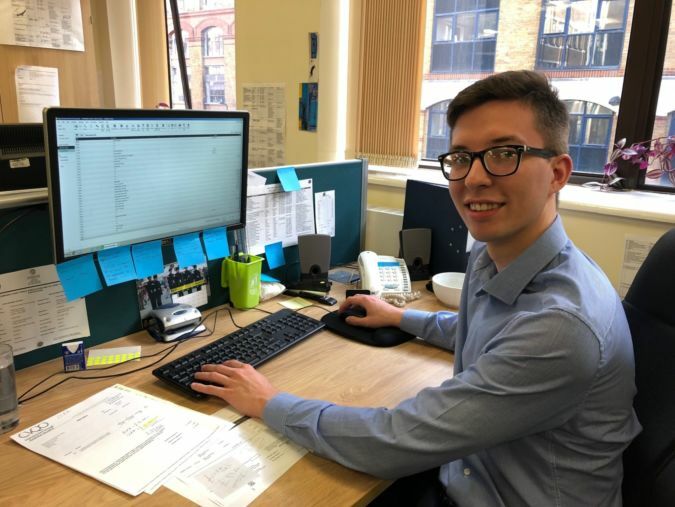 Eighteen-year-old Tyler Marin, who has completed his qualifications after a year at the CCFA/ACFA HQ at Holderness House, London, is moving on to begin his AAT Level 4. He said: "This is definitely a great place to start as you will build your knowledge progressively throughout the year beginning from Level 2 through to the end of Level 3." The apprenticeship, which is based at the HQ in London, is offered in partnership with the College of Haringey, Enfield and North East London at the Tottenham Centre. The successful candidate will complete a 14-week pre-Apprenticeship Course (spending three days a week at college and two days in the CCFA/ACFA Finance Department) which will result in the award of the AAT Level 2 Foundation Certificate in Accounting. This will be followed by a 12-month AAT Level 3 Advanced Accounting qualification (consisting of one day a week at college and four days' practical experience in the Finance Department). Tyler Marin (18), from Romford, took up the position in September 2017 after deciding that an apprenticeship would be a better route for him than A Levels. As an Army Cadet, he spoke to his Detachment Commander who told him of the opening at the CCFA/ACFA. I personally prefer more of a learn-on-the-job approach to learning as I like to progress at my own speed, therefore an apprenticeship was perfect for me. What have you gained from your apprenticeship with the ACFA? I completed my Level 2 AAT, I've nearly completed my Level 3 and I've gained a deep working knowledge of accounting procedures and work ethics. Being able to work with everyone in the office and to see just how much goes into the Army Cadet and Combined Cadet Forces. As a cadet I didn't realise just how much planning and organisation goes on to run the activities we enjoyed. But the highlight has to be a successful audit as you can see the work you have done throughout the year come to fruition! What would you say to others thinking about applying for this role? If you are a looking for an apprenticeship in accounting, this is definitely a great place to start as you will build your knowledge progressively throughout the year with a lot of support from people in the work place. I hope to complete my AAT at Level 4 to receive my MAAT status as well as taking a Chartered Accountancy course. Applicants must have five GCSEs at Grade C or above which must include Maths and English (or are anticipated to achieve these grades this summer). Experience of the cadet forces will be an advantage.